The scene outside Fenway Park on its opening day, April 20, 1912. The crowd was packed in for this game in 1912. Duffy's Cliff in left field of Fenway Park’s original layout got its name from Duffy Lewis, the Red Sox left fielder in 1912. Red Sox pitcher Smokey Joe Wood warmed up amid a big crowd at Fenway Park in this 1912 game. Fans caught a peek of the 1912 World Series through holes in the Fenway Park exterior. The Royal Rooters and police tangled during the 1912 World Series during a dispute over seating. Babe Ruth in action as a pitcher for the Red Sox in 1914. Fenway Park was packed when the Boston Braves borrowed the field to host the 1914 World Series against the Philadelphia A’s. Irish Republic leader Eamon De Valera spoke to a crowd of about 50,000 people at Fenway Park in 1919. A flag raising at Fenway Park in 1924. Red Sox trainer Bits Bierhalter stoked the hot stove in clubhouse at Fenway in 1928. Before the 1934 season, new Red Sox owner Tom Yawkey undertook a radical renovation of Fenway Park that resulted in the modern-day wall being constructed. Workers put a backstop up at Fenway Park on April 17, 1934. The competitors raced toward a close play at first base during this game in 1934. Babe Ruth fell to the ground after a close pitch during a Yankees-Red Sox game in 1934. A crowd gathered outside the park early on Aug. 12, 1937. The stands were packed for this game in August 1937. The grounds crew rolled out the tarp during a rainstorm in 1937. Frank Addeman and Roland Robinson cut the outfield grass in 1940. The Red Sox honored legendary pitcher Lefty Grove with a plaque on June 8, 1940. Ted Williams, in his second year with the Red Sox, pitched two innings of a 12-1 loss to the Tigers on Aug. 24, 1940. Williams, left, and Johnny Pesky could only watch the Red Sox in action against the Yankees at Fenway Park on April 27, 1943. They had taken leave to serve as US Naval Aviation cadets. In 1944, Fenway Park hosted President Franklin D. Roosevelt in a rally days before his reelection. Fans lined up outside Fenway Park to get in for this July 17, 1946, game against the White Sox. A capacity crowd packed into Fenway Park for the 1946 All-Star game. Three months later, crowds would fill the park again for the World Series against the Cardinals. Workers hung a sign announcing Game 4 of the 1946 World Series against the Cardinals. The Red Sox unveiled the AL pennant, the team's first in 28 years, on April 15, 1947. 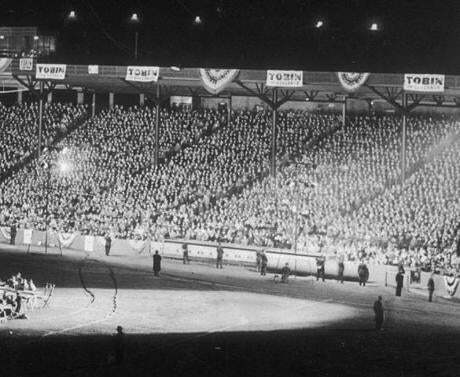 The lights turned on for the first time at a night game at Fenway Park on June 13, 1947. The bleachers were packed for this 1948 game. Bobby Doerr hung out with his son, Donnie, 6, before the Indians-Red Sox one-game playoff on Oct. 4, 1948. Ted Williams followed through on a home run in this 1948 game.